Updated: Israeli soldiers abducted, late on Wednesday at night, two Palestinians, and injured many others, after the army invaded several areas in the Hebron governorate, in southern West Bank. Media sources said the soldiers invaded Khirbat Qalqas village, south of Hebron, before storming and ransacking homes, and abducted a young man, a former political prisoner, identified as Na’im Ismael Abu Turki. They added that the soldiers also invaded and searched at least one home in Halhoul city, north of Hebron. The soldiers also abducted Ahmad Fathi as-Sous, 17, from the al-Fawwar refugee camp, south of Hebron, after teh army closed the iron gate at the entrance of the refugee camp, and prevented the Palestinians from entering or leaving it. 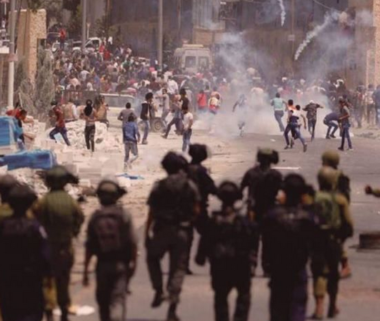 In addition, the soldiers invaded Kharsa village junction area, southwest of Hebron, and fired many gas bombs and concussion grenades at Palestinians, protesting the invasion.